Pagosa’s own professional theatre, Thingamagig Theatre Company, won almost half of the available awards in a 2017 statewide contest sponsored by BroadwayWorld Denver, according to results announced in Denver on January 12. This showing is by far the best of any theatre company in Colorado. Thingamajig was the winner in 12 of the 27 categories in the competition that honors productions which opened in Colorado between October 2016 and September 2017. The twelve categories which Thingamajig won are best dramatic play (“God of Carnage”), best comedic musical (“Hairspray”), best director of a play (Michael Thomas Walker for “God of Carnage”), best actor in a play (Tim Moore in “God of Carnage”), best actress in a play (Christina Norris in “God of Carnage”), best actress in a musical (Jameelah Leaundra in Elton John’s “Aida”), best supporting actor in a musical (Dan Morrison in “Hairspray”), best supporting actress in a musical (Hannah Zilber in “Hairspray”), best choreography of a musical (Paul Thiemann for “Hairspray”), best lighting design of a play (Laine Wong for “God of Carnage”), best set design of a play (Laura Moore for “Buyer & Cellar”), and best small ensemble in a musical (“Hairspray”). 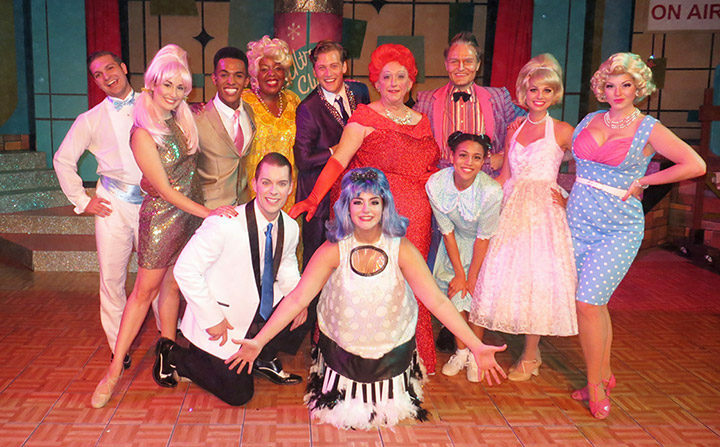 Thingamagig’s summer 2017 production of “Hairspray” won best comedic musical and four other awards in the 2017 BroadwayWorld competition. Photo courtesy Carole Howard. Thingamagig is a 501(c)(3) nonprofit professional theatre in residence at the Pagosa Springs Center for the Arts that produces dramas, comedies and musicals year-round. The company was co-founded seven years ago by the brilliant husband and wife team of Tim Moore, producing artistic director, and Laura Moore, production and business manager, both of whom won individual awards for their work in 2017. “The high number of nominations for our performers speaks to their professionalism and the quality of entertainment they bring to Pagosa Springs. Their enthusiasm and Broadway-caliber performances never cease to energize and enrich our highly sophisticated audiences,” said Tim Moore. 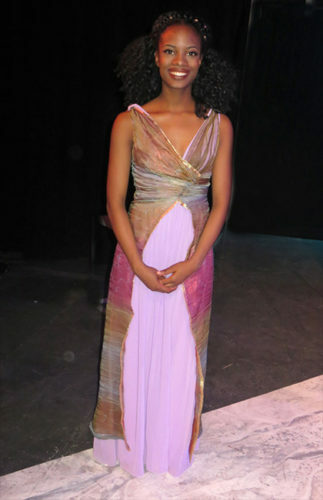 Jameelah Leaundra was named best actress in a musical for her role in Thingamajig’s production of Elton John’s “Aida.” Photo courtesy Carole Howard. Thingamajig competes in the Denver professional theatre market, which also includes Rocky Mountain Repertory Theatre, the Evergreen Chorale, Denver Center Theatre Company, Creede Repertory Theatre, Merely Players, the Midtown Arts Center, the Open Stage Theatre and Center Stage. Other Thingamagig nominees making it to the final ballot included best actors in a musical (Dennis Elkins in “Hairspray,” Luke Hefner and Dan Morrison in “Aida,” and Tyler Price and Stuart Rial in “Big River”), best actor in a play (James Scott in “Santaland Diaries” and Andrew Start in “Buyer & Cellar”), best actress in a musical (Heather McCall in “Aida,” Marion Bienvenue in “Hairspray,” and Boni McIntyre and Sarita Amani Nash in “Sister Act”), best dramatic musical (“Aida” and “Big River”), best music director (Boni McIntyre for “Sister Act,” “Hairspray” and “Aida”), best supporting actor in a musical (Sheldon Steele, Dan Morrison, Luke Hefner and Ian Lah in “Hairspray”), best supporting actress in a musical (Sara Burks and Shuga Henry in “Hairspray”), best small ensemble in a musical (“Aida” and “Sister Act”), and best Colorado debut in a musical (Marion Bienvenue, Shuga Henry and Sara Burks in “Hairspray,” Jameelah Leauandra in “Aida” and Tyler Price in “Big River”). Winners and nominees who have returned to Pagosa to perform in Thingamajig’s current Winter Season — which includes “Tuna Christmas,” “Circle Mirror Transformation,” and “Proof” — are Dan Morrison, Dennis Elkins, Boni McIntyre and Christina Norris The February production, featuring local actors, will be “Welcome to Siberia… Now, Go Home!” written by local writer Karl Isberg. Globally, various BroadwayWorld award contests this year took place in a record number of markets, with a record number of votes, including 56 cities across the U.S. and 11 countries around the world. BroadwayWorld is the largest theatre site on the Internet, covering Broadway in New York, the West End in London and other key artistic locations worldwide, including Denver.